Surprisingly, they consistently use two major hotspots along the country's west coast. Most of the whale sharks found there are juveniles. By understanding where the younger members of this endangered species live, researchers can better inform governments on how to protect them. "Fisheries and boat collisions are the most important threats to these animals, so we need to know their migration routes and habitats," said FIU marine biologist Jeremy Kiszka, a member of the research team. What they discovered was that whale sharks spent a substantial amount of time near the tiny island of Nosy Be off Madagascar's northwest coast. They also found a second location favored by the sharks about 112 miles south near Pointe d'Analalava. Why? They're following their food. Whale sharks feed off tiny organisms that swim in the ocean and small schools of fish, which tuna also chase. "They need productive habitats to sustain their energetic needs," Kiszka said. 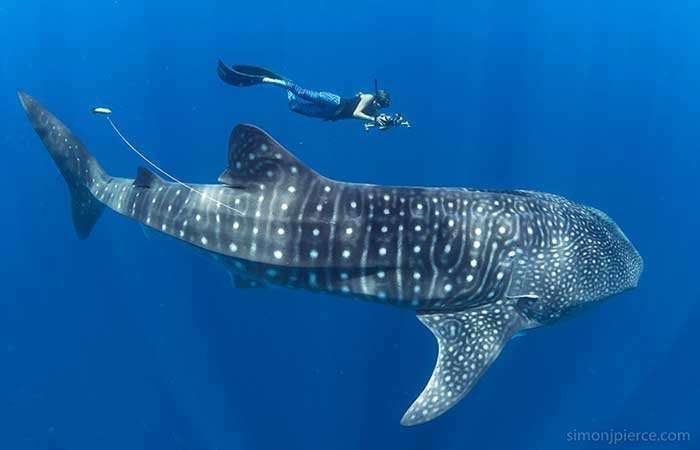 "The waters around Nosy Be have lots of life, lots of food for whale sharks." Researchers are helping Madagascar's government develop guidelines for responsible whale shark viewing activities, which have become popular with western tourists. Getting the information on the sharks' movements was a bit of a challenge. Kiszka and the team surveyed whale sharks from boats and they placed satellite tags on eight of the massive fish to gather the data. Their findings were published recently in the journal Endangered Species Research.